Approaching the first severe warned storm of the day near Humboldt, Iowa. First getting on the tornado warned storm near Stanhope. Nice base and low inflow tail with mid level inflow streaming into the updraft. Storm had a massive hook echo forming around this time. Looking directly at the hook wrapping around the storm and forming into a mesocylone northeast of Stanhope at 7:21pm. Forming a wall cloud a minute later. Our position in the crosshairs relative to the hook echo at 7:22pm. Mesocyclone starting to rapidly rotate and tighten up at 7:32pm. Video still of the tornado 3.5 miles east of Stanhope a short time later. After seeing the tornado near Stanhope, this funnel developed near Garden City, IA at 7:58pm. Underneath the base of the storm near Garden City. Heading home up I-35 after a fun and successful chase day. This was a chase day in which my gut feeling that not much was going to happen in the target area was completely wrong. 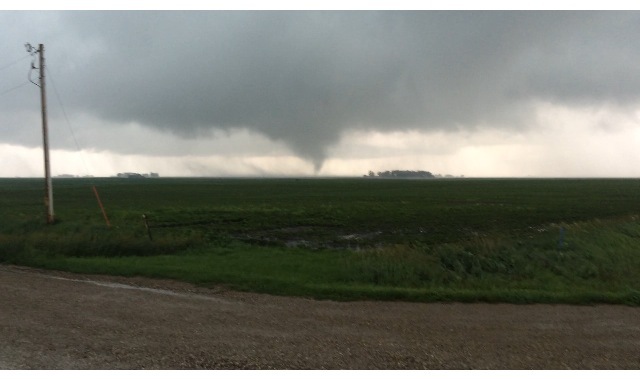 Luckily I had a friend, Wes Hyduke, coaxing me into leaving after work and chasing this set-up in central IA. The reasons I did not have a good feeling about the day were because of morning and ongoing convection with quite a bit of cloud cover, as well as the outflow boundary/warm front well to the south near the Des Moines area, which appeared to be total displaced from the better 50-60 kts bulk shear to the north across MN. Surface winds feeding any storms that developed were weak, on the order of 10-15 kts at the most. The environmental conditions that this area DID have going for it were that the clouds thinned/cleared out through the afternoon, allowing for unstable conditions to develop in the vicinity of 3,000-3,500 j/kg of MLCAPE, dewpoints in the lower to middle 70s, bulk shear an ok 35-40 kts, and an outflow boundary from morning convection that was slowly receding back to the north towards the Ames, IA area. It really was a tough forecast and models did not appear to be handling the situation very well with several completely different solutions and missing a lot of current convection. All in all, I was on the fence about going but Wes saw the environment and assured me that at least some decent supercells would develop along and north of the outflow boundary. We left the Twin Cities shortly after 2pm and traveled south on I-35 to Clear Lake, IA. Right as we were leaving, the Storm Prediction Center (SPC) issued a mesoscale discussion, outlying the increasing risk for severe thunderstorms across eastern NE and western/central IA as the afternoon progressed. They noted the decreasing cloud cover leading to destabilization as well as steep mid-level lapse rates greater than 7 C/km, and also the more backed surface winds across IA that may enhance the tornado potential. A Tornado Watch was soon issued for the area at 4:05pm, lasting until 11pm CDT. After having an early dinner in Clear Lake, we traveled south on I-35 to the Hwy 3/Hampton exit as a thunderstorm was developing out towards Storm Lake. We went west on Hwy 3 and then north on Hwy 169 and then west to intercept the storm northwest of Humboldt. This storm had looked good for a moment and actually had a nice wall cloud on it as we caught up to it initially. This storm soon crapped out and weakened considerably as we followed east through Bode. Failing to get AT&T data, our only option was to head east and stay with the storm/get ahead and see how the radar looked when we got data. As we went back east on Hwy 3 with our weak and non-interesting storm, we were able to get data again near Clarion. Right away the radar lit up with a couple already severe warned storms that appeared to be right on the outflow boundary to our south. We pushed south on Hwy 69 and punched the leading severe warned storm near Hwy 20 east of Webster City. This is when the cell to the southwest became tornado warned with a nice hook echo forming. I decided to make a move to punch through the forward flank core on 270th St and then south to get ahead of the hook and in the notch of the storm near the intersection of Neely Ave and 330th St/D56. When we got to this intersection, you could visually see the reflectivity ball coming around the south side of the hook that we could see on radar. There was some rotation right in the notch on the north end of this ball of rain with a lowering tucked away closer to the main core to our northwest. Soon, rotation began to increase with a mesocyclone becoming more apparent in this hook echo. We noticed a surge of rear flank downdraft (RFD) winds coming around the west side of the hook and around the mesocyclone and I figured something was going to happen here soon. At this point, it was getting close to us so we moved east down the road to Nelson Ave, passing the Stanhope Fire Dept on the way. 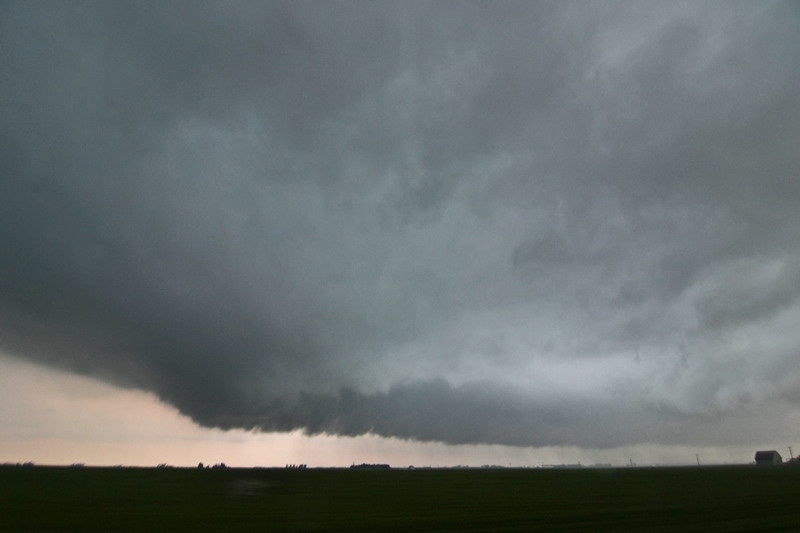 Right as we stopped, I noticed a vorticy kicking up dirt underneath the meso and THERE WAS THE TORNADO! We watched as vortices condensed, kicked up dirt aggressively, and spun back up into the low cloud base. This happened several times with a few vortices at once on occasion for about 2 minutes at this location, 3.5 miles east of Stanhope. We continued to move east with the storm on 330th/D56 towards Jewell as vortices continued to kick up debris clouds underneath the meso. It was interesting as this storm had right-turned and the tornado and storm were traveling east-southeast, rooted right on the outflow boundary from the earlier convection. We got ahead of the meso on Hwy 69 south of Jewell as a large funnel cloud formed once again but did not touch down. We then traveled east through Randall and crossed back over the interstate on 380th St/D65 and then got ahead of the storm in the small town of Garden City. Just north of town, the storm produced another low funnel that may have touched down but not quite sure as we could not confirm. After traveling east again over Hwy 65, we stopped again to take photos of the storm that appeared to be cycling at the time and not looking as great. All of a sudden the darn gas light comes on and we realized we were almost running out of gas! At this point, there was nothing we could do. We had to go back to Hubbard to get gas or we were going to run out. There was no way we could get back in front of the storm before sunset so we decided to end the chase day here. Unfortunately, the storm produced another and more photogenic tornado further east near Conrad that we would have been all over if it was not for the gas issue. Oh well, a great chase day that was rather unexpected for me going into it.